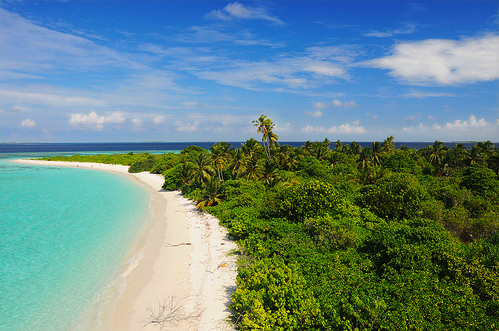 This is a view of my homeland 'Maldives' that originates from Sanskrit word mālādvīpa' meaning garland of islands. Our republic consists of around 1,200 islands of which 250 are inhabited. With a population of around 385,000 and an area of just 298 sq. km., it is Asia's smallest nation in terms of both area and population. 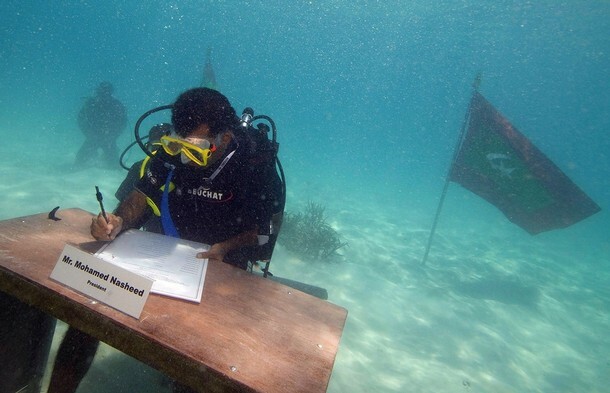 A couple of days ago, the awareness campaign for climate change got a new boost when the government of the Indian Ocean republic of The Maldives held an underwater cabinet session that lasted for around 30 minutes. 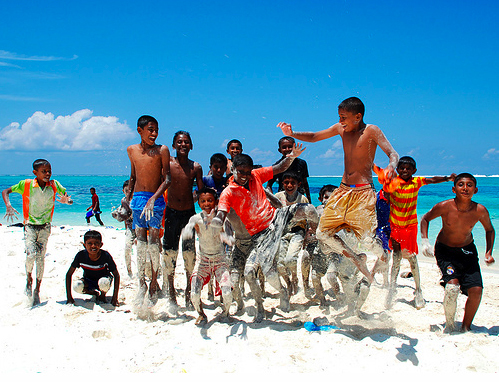 My photojournalist friend from Maldives Mohammed Abdulla Shafeeg has dispatched this fascinating photo essay. 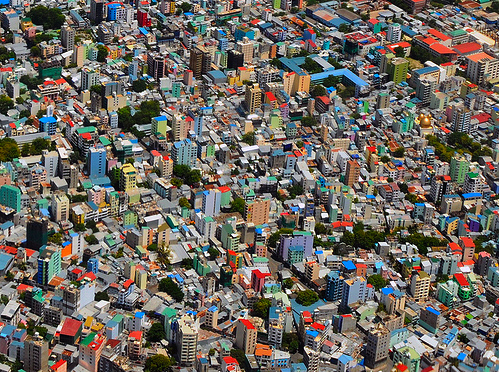 Malé is the capital of Maldives. With a population of more than 100,000, around one third of the nation's population lives in the capital city. 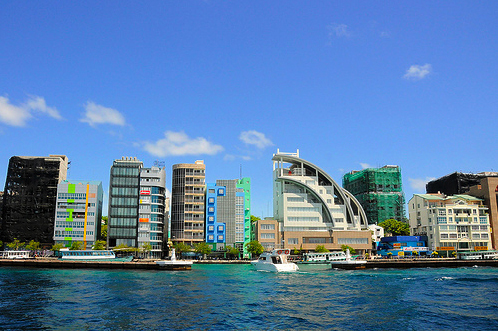 I head to Malé to meet a few friends who will join me for the coverage of the historic event. While it is a very nice city to live in, residents often complain that it has become too overcrowded and faces housing issues. 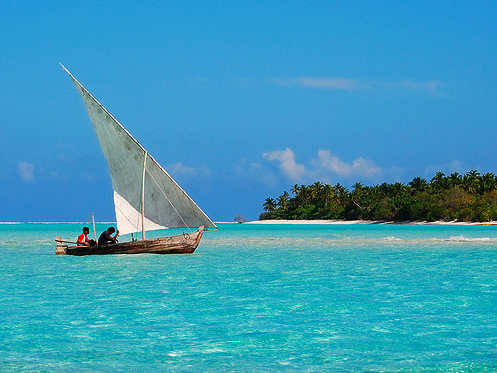 We usually use powerboats or sailboats called 'batheli' to travel from one atoll to the other. We use small boats called 'dhoni' to travel from one island to the other. Just before the event began, we took a short break during which we refreshed ourselves with some breath-taking views. 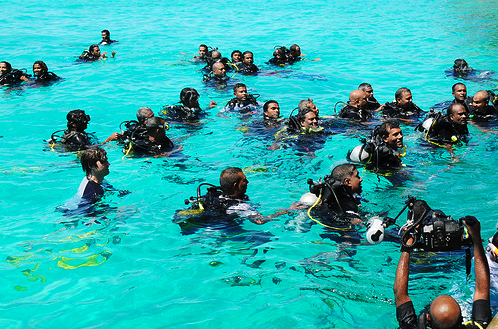 Soon the cabinet assembled at the Girifushi lagoon at 1030 in the morning. 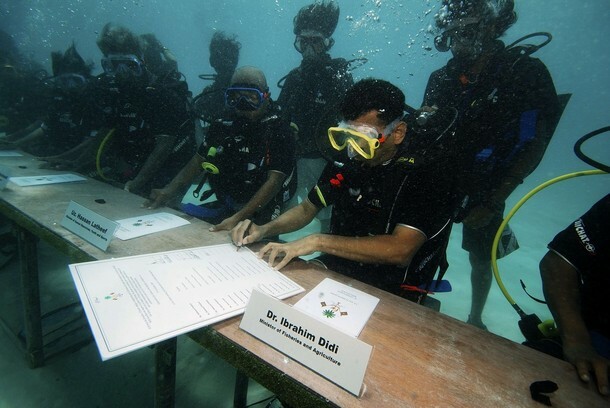 Eleven cabinet members and a couple of secretaries attended the first ever underwater cabinet meeting of the world. Sitting 1.5 meters deep in the lagoon, the cabinet ministers and secretaries used hand signals and a white board to communicate. The meeting concluded when members of the cabinet signed a declaration calling on all nations to “join hands and reduce carbon emissions and bring down the level of carbon in the atmosphere to below 350 ppm”. The President of Maldives, Mohammed Nasheed, signed the cabinet declaration to conclude the 30 minutes long cabinet meeting. The 42-year-old former journalist is also a certified diver. Soon after attending the press briefing of the historic underwater cabinet meeting, I headed to the beach to find kids playing and having fun as usual. During my informal chat with the kids, I learned that they had a fair idea about global warming and were aware of its consequences on their future. Overfishing is another serious problem my country is facing at the moment. 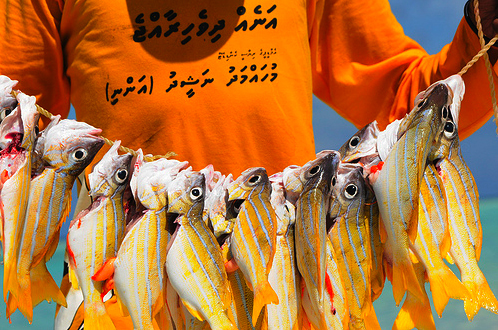 According to a recent Greenpeace report, groupers are becoming extinct in the Maldivian waters and fishermen are reporting declining numbers of the fish every year. 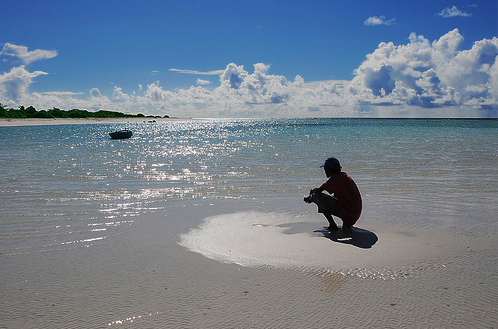 Sea cucumber virtually disappeared from the island's waters almost a decade ago. Dwindling fish stocks also means a drop in visits by migratory birds that will have a great impact on the tourism and ecology of the island. 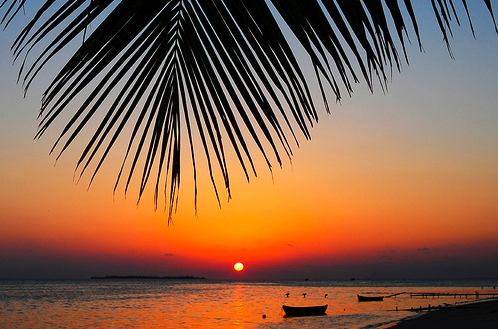 Maldives' 644km long coastline hosts some of the best exotic tropical beaches in the world. 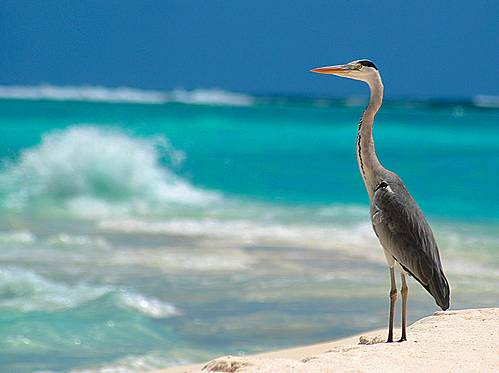 The beaches are coming under great threat by rising sea water levels prompted by global warming. 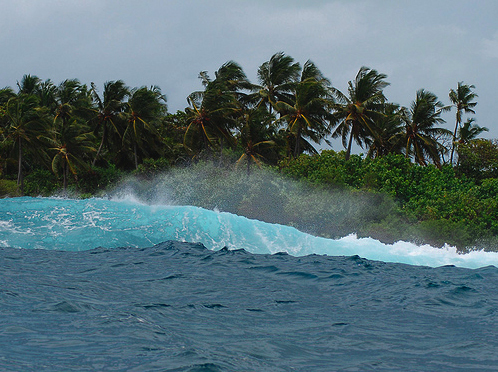 In 2007, the UN Intergovernmental Panel on Climate Change predicted that sea level rise will submerge the low-lying islands of the Maldives within a century. 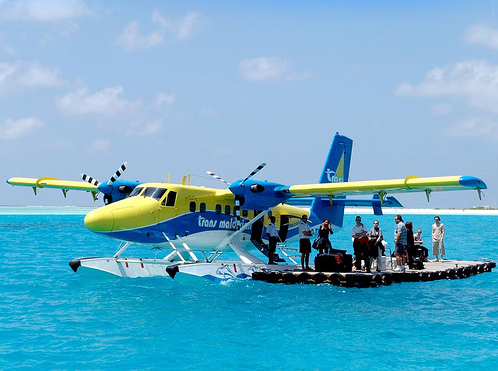 The ministry of tourism recorded a 10.5 percent decline in tourism this year as only 282,518 foreign tourists visited Maldives by end of May this year. Analysts are of the view that the global economic crisis and pandemic flu were to blame for the sharp decline this year. 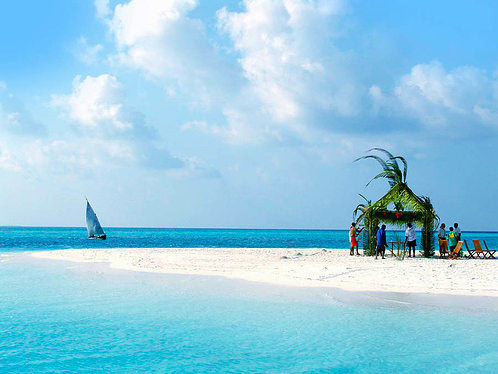 The palm-fringed white sands, clear waters and tropical plant life of Maldives is extremely seducing for couples. By providing the ideal setting for weddings, the islands are a top destination for a large number of couples geting married every year. 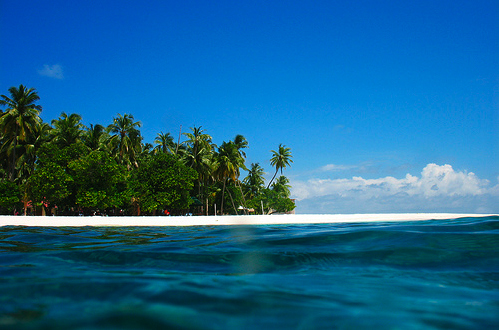 A view of an island from sea level. 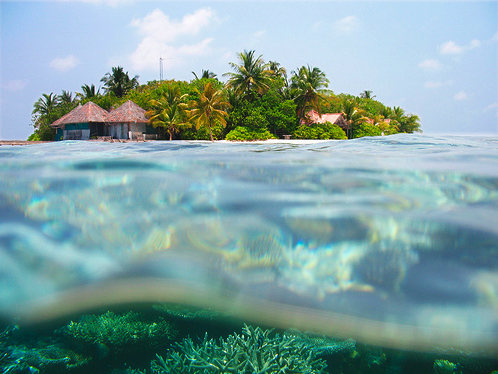 Most of the islands in Maldives are just over a meter above sea level. Don't be surprised if I tell you that if you climb a small palm tree you can be higher than the highest point of land. 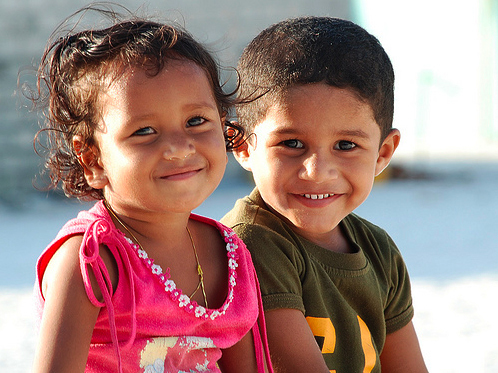 All eyes of the Maldivians are on the upcoming Copenhagen climate change summit. Our president has appealed for a concerted effort to commit to “a better deal” to ensure that “everyone survives”. As the Kyoto Protocol expires in 2012, world leaders will congregate in Copenhagen in an attempt to forge a successor to the 1997 treaty.